A common problem we often face with, when uninstalling unnecessary software, is various traces left in the system: unneeded files or folders on a disk, registry entries and so on. This can happen even if an application was removed correctly with its own uninstaller - a special program provided by a vendor to uninstall the application. 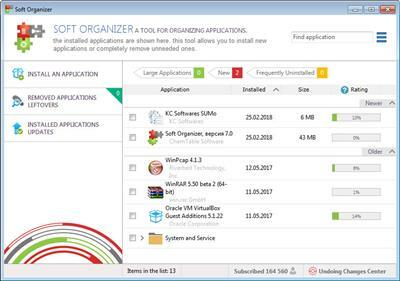 The Soft Organizer program is intended to solve this problem: It allows you to COMPLETELY uninstall unnecessary applications from your system.